Creativation show and a GIVEAWAY! Good morning SCT Friends, Catherine here with you on this cool and blustery morning at SCT HQ! Last Friday several of the SCT team headed to Phoenix, AZ for our annual industry trade show, Creativation. 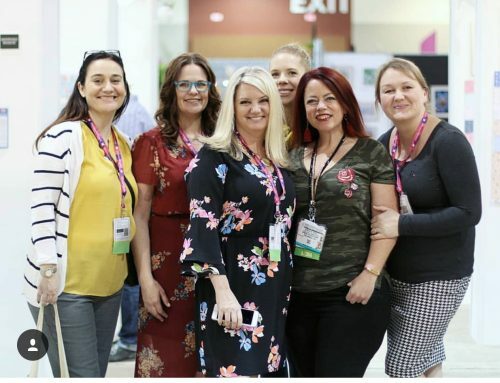 This trade show brings together the Craft & Hobby Association in one large convention centre room which is attended by retailers, designers, bloggers and media all to see the product releases so many of our favourite companies will have available in the upcoming year. Are you thinking it must be like being a kid in a candy store? It is just like that! 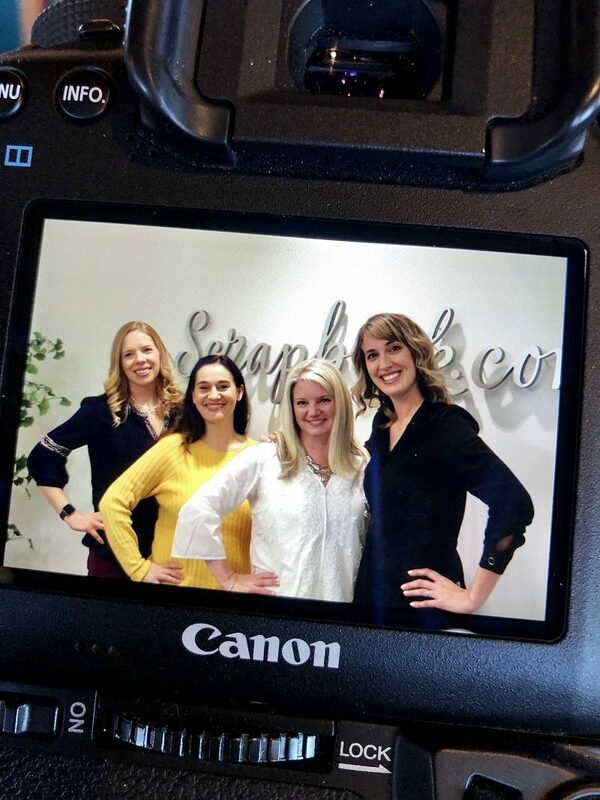 Our team was on the floor for three days, planning our upcoming editorial, catching up with industry friends, meetings around the clock and of course, trying to bring as much of it as we could to you through Facebook LIVE and Instastories. We wanted you to see all that we could share and loved the time we spend with so many of our partnering companies. If you missed it, be sure to look back a few posts ago, visit our Facebook page or visit us on YouTube to see all the videos. New this year we co-hosted a little event with our friends at Simon Says Stamp called “Meet Me At The Show!” Our original thought was maybe 60-80 friends and companies may join us. In the end, 220+ friends and companies joined us! 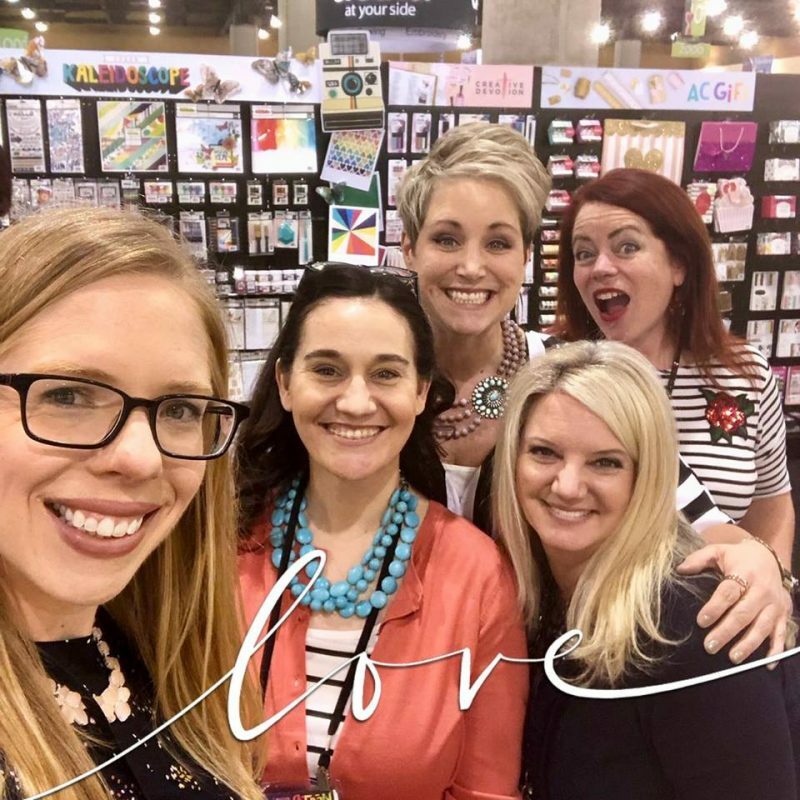 We had 14 make n’ takes, an incredible goody bag, great good but the best…seeing our community come together in one big room to celebrate papercrafting. We tried to get one big “Ellen” style selfie and I think Susan, our Editor-in-Chief, did a great job! Our final stop was a tour of the brand new Scrapbook.com facility. Do you really want to feel like a kid in a candy store? Scrapbook.com is the best candy store EVER for papercrafters! Their new offices are beautiful from back to front and the warehouse is the most efficient, bright place you can imagine. Such care and attention to all of the needs of their team and I’m not sure I’ve ever seen a happier place to work. While we can’t really show you much in the way of photos, we did enjoy some special time with Jessica Harrington, the CMO. As our largest distributing partner for the magazine, we love this partnership with them! Of course while in Phoenix we enjoyed many dinners with our team and industry friends including Vicki Boutin, Shimelle, Paige Evans, Melodee Cloud and more. If you’re ever looking for some fun places to eat be sure to check out The Henry, The Arrogant Butcher, or Chico Malo. All amazing! Team member Meghann Andrew was in charge of where we ate and she did not disappoint. A nice way to end a long day! One more fun part? Celebrating our 30,000th follower on Instagram the moment before we all boarded our planes to come home. Meghann and I needed to celebrate that! Can you see that we were a little tired but so happy? Fun way to end a great five days! Thank you to all our followers here, on Facebook, Instagram, YouTube and more! Now, if you’ve read all the way to the end, then you know we have a Creativation giveaway for one lucky reader! We collected some fun products from our many of our friends and today’s surprise package will have products from American Crafts, Photo Play Paper, My Mind’s Eye and even a cute little pin from Doodlebug! For an opportunity to win, leave us a comment below and tell us what your most anticipated product is from the show! Please leave your comment by January 31st! Good luck! They say when you enjoy what you do it never feels like work. I could not agree more. Our Scrapbook & Cards Today family is a special one and I’m incredibly blessed to work with them. A Creativation show recap and some prize winners! Monday with Megan! Our Editor’s recap of Creativation! So awesome! What fun photos!! I’m excited for it all. I don’t think I could pick just one thing, there’s so much to love!!! I can’t wait to see all of the sweet and happy goodies from Doodlebug, their products always make me smile and create pretty crafty things!!! I loved watching all the live videos last weekend with you and Meghann. I’m really looking forward to the new Echo Park lines, in particular those for travel! Thanks for this chance! The foil pen used in machines like Cricut, Brother etc. from WR Memory…..
Other FB live booths looked great too!! I can’t wait for the Quill foiling tools! I’m mostly looking forward to getting my hot little hands on Wendy Vecchi’s new Stencil Staytion! I’m also very intrigued by the show’s most innovative new product by We Are Memory Keepers. That little heated pen might actually get me to clean the cobwebs off my Cricut! My mind (and pocketbook) is blown each and every year with all the new products. It’s always so hard to choose what to purchase first! I can’t wait for HERO ARTS Layered Iris stamp set! So many venders and awesomeness this year, its so hard to narrow down favorites! Looks like you all had such fun. I’m looking forward to products from Gina K designs, Altenew and Hero Arts!! Thanks for all of the great updates on all the goodies to come!! I am looking forward to the paper collections from Graphic 45 and Prima! Their paper lines are always so gorgeous! I am super stoked about ShImelle’s new line. I love her girlie lines..they all have a bit of edge and I like that. I was at the “Meet Me at the Show!” event and it was FANTASTIC! You did a great job putting together an incredible evening. Thank you so much! I hope it’s an annual event. I second what Connie said about the foil pen…it may have finally edged me into getting a die cutting machine! I am looking forward to Paige Evan’s new line and of course, some Tim Holtz products. There are too many I want. It is hard to choose with so many great new products. I love the new lines by Simple Stories – excited to get some of those. I absolutely adore the new collections that I saw from Simple Stories. Love their stuff!! I’m looking forward to the new paper, stamp and die sets. It is always so nice to see what comes from the conventions. I kept up with all of your posts, and you all were having such a good time. There are so many new products to choose from it’s difficult to choose just one. I am really looking forward to the beautiful products coming from Vicki Boutin❤️ So colourful!!!! Simply – I’d love it all!!! But that would require a new house and that ain’t happening so I would settle for a little lawn Fawn fun. Glad everything went so well for you and the team. Loved watching your stories. See you in TO! I have been getting excited about the new Lawn Fawn dies, paper, and stamp sets. There are so many new things, it can easily get overwhelming, but they are all so inspiring. So many cool new products! I’m looking forward to the Distress sprays, Gina K, Thermoweb, Taylored Expressions new plaid builder. . . I could go on and on! My New Year’s Resolution is to “steal” a few hours a week doing what I love – scrapbooking without feeling guilty. Your magazine has always inspired my creativity. Can’t wait to see what 2019 will bring! What fun getting to see this through your eyes! So many fun new products! I also love seeing all of the inspiring projects made with the new products! Love anything from Paige Evans and Vicki Boutin! I could list so many! Sadly, I am usually late to the party when it comes to getting new stuff. Trying to use what I have. Would love to win some new goodies to play with! Thanks so much!! So hard to choose but Sparkle City by Shimelle is on my must-have list (hopefully available in Canada). And anything with gnomes. Hi Catherine and the entire team! It was fun following y’all via IG, Facebook, Youtube and here. So many new products, hard to pick just one. But, anxious as always to see Doodlebugs new stuff! There is so much scrappy goodness coming out soon! I’ve filled up my wis list again at my favorite online store. Crate Paper, Kaisercraft, Pink Paislee, Pebbles, Simple Stories, Vicki Boutin !!! Can’t pick just one thing. Great photos! A fun time was had by all. Two of my fav products was the WRMK Foil Quill and Weny Vecchi’s Stencil Staytion – I can see using that in many ways. Thank you for sharing Creativation with us. Watched all your videos from Creativation! Can’t wait for the new Lawn Fawn release, Staytion and Waffle Flower Water Media Mat. Too many things to want…brain overload! Can’t wait to try some of the new products. Thank you for sharing your time there. It is hard to just pick one but I am especially curious about WeR Memory Keeper’s new hot Foil Quill. Great feature! Looks like soon much fun! I love your happy dance with Meghann! There were so many products that looked wonderful, but I always look forward to new things from We R and products from Pinkfresh, two of my favorites! As I watched all the videos I was blown away by all the beautiful product that the various vendors have come up with. Talk about creative people!! The foil pen for the machines was definitely the top product but since I don’t have a machine anymore, I will have to choose the products from Simple stories as my choice. Any of them are great and I can’t wait to be able to start shopping their line. I have to say though that I will probably be shopping at all of them because not one of them failed to get my attention with at least one of their products. Congrats on reaching 30K followers on Instagram and thank you for sharing all the product showcases during Creativation. I’m most looking forward to the WRMK foiling pen which is so innovative, the picture switcher die from Lawn Fawn, new papers and stamps from Doodlebug, Jillibean Soup and Simple Stories, and Altenew’s layering dies and washi. Thank you for the chance to win some of these amazing goodies. I love everything from the show and could/would make incredible projects with all of it.I sooo love this wonderful industry.Thank you. WOW…. you all had so much fun!!! I was drooling all over just looking at all the new products. I can’t wait for all of the new releases. I think i am looking forward to the new papers and stamps from Doodlebug. One product, you’ve got to be kidding!!! Watched all the Live videos and was so wowed by everything. I’ve already pre-ordered my Vicki Boutin stuff from her new line, can’t wait for all that goodness to arrive. Tim’s new dies, stamps, papers etc. would be my next wish list. I could go on but there isn’t enough space, lol. Thanks for a fun filled weekend through your eyes. There’s so much to be excited for! I think I’m really loving the newest Brother Scan N Cut. Thanks for all the insight into the show!! I have a loooong list of most anticipated products lol. One the top ones are the Tim Holtz oxide sprays. What a great time you all had and a fun opportunity that you shared with us your videos of the many vendors’ booths! I loved the G45 new lines and also the new Altnew layered dies, looking forward to trying those! So many great products new for this year, it was really hard to narrow down to just one. Thanks for sharing your experience there, it was really fun and exciting to see. Oh gosh, where do I start? I watched a few of the LIVE stories by you guys, LawnFawn, and other companies that were there on Instastories. I am really looking forward to new stamps and coordinating dies from Lawn Fawn. I also have a new found love for Echo Park and Paige Evan’s, so anything by them will make me happy when it comes out! Thanks for such a generous giveaway, and I’m so happy for you to have reached 30,000 followers!! Yay!! I’m sure I’ve only seen a fraction of what’s coming out…but I’m excited for a couple of the new Echo Park lines, Summer Adventure and All Aboard! Thanks for the chance to win! Looking forward to seeing Shimelle – Catherine Pooler – and Gina K Designs new releases. Not having a brick an mortar store in our town … we totally depend on what we see online. Tutorials and you tube provides us with sneak peeks at new things and love this. I need, need new inspiration!! I am excited for prima’s midnight garden and moon child lines. I have also fallen in love all over again with hero arts, lawn fawn and We R Memory Keepers. That Foil quill !!! What an exciting thing for your team to experience. I am very much looking forward to Prima and Graphic 45’s newest lines. Am also looking forward to learning about new tools. Thanks for another giveaway. Everything looks amazing, but I’m really excited for the new line from Paige Evans! I love her stuff! Wish I could have been there! The videos were a blast! THANK you so much for sharing them! So many cool new product lines coming out! There was so much love for SCT peeps too! THAT was really cool! It’s fun to see the videos because there is so much more to learn aside from the new stuff! Like Hero Arts turning 45 this year!!! Mother and son…amazing! I would have to say that hands down I would be that kid in a candy store happy if I was to win a goodie bag from them! But Doodlebugs has some cool new stuff too as does Simple Stories! I am one excited paper player!! Thanks for all the video shares! Your SCT Peeps appreciate all the time and effort put into the blog posts! Christmas in February (when I receive the box). Excited to see all things new but if I had to choose, it would be new patterned paper and colour combos. That and new Lawn Fawn stamps and dies! I’m very much looking forward to the new Bella Blvd Home Sweet Home line and their new heart acrylic shapes. I am also in love with their 4th of July line. Can’t wait to get my hands on all the new Doodlebug! Shimelle, Paige Evans, Maggie Holmes and Amy Tangerine lines all rank high on my list, too! I’m looking forward to a lot! Heidi Swapp’s Wolfpack and Vicki Boutin’s Color Kaleidoscope are my faves. Loved watching all the videos from the show, looks like you ladies had an awesome time! It was so much fun to “follow along” with you at Creativation. I’m looking forward to pages new line, Vicki’s new line and the stamps and dies from lawn fawn. I’m looking forward to the new products from Gina K. Designs! Thanks for showing all the videos from the show! I am looking forward to so many great products that were revealed during Creativation! I especially love the new Julie Nutting doll stamp release, the WRMK foil quilling tools, and the Graphic 45 Bloom collection. But I still haven’t seen everything. Need to catch up on all the wonderful videos. Thank you for sharing your adventures at Creativation with us! I would love to win all the fun products you collected for this giveaway. Thanks for all the great updates from Creativation. what lucky ladies to get to enjoy your jobs and see such great people and products. I am personally excited for the new lawn fawn stamps and dies and Tim Holtz new products. must haves for me. My goodness, I don’t known to pick one product or company! But I love Gina K stamps. Great Videos!! I love all the foil items, Tim Holtz new products, Doodlebugs new stuff—-there is so much. So many wonderful new products to dream about! I’m really interested in WRMK foil quilling. It would be so much fun to be able to attend Creativation. I’m looking forward to many different products, but especially the foil pen and Gina K. Designs! Thanks for all the videos. I love seeing all the cool new stuff. Going to Creativation would be a dream! So many awesome products coming out. I am really looking forward to the new items from Gina K, Tonic, Pink Fresh and the list goes on. I live in Phoenix and when I heard Creativation was here I was trying to figure out ways to crash the party! It looks like so much fun to see all the new designs, tools and the designers themselves! I am fascinated by the process of creating things. I love to see how different people come to decisions about their art. So inspiring for sure! I’m looking forward to the new Hero Arts Hot Air Balloons and Fly High Animals! There are so many other fun things to try out! Thank you for sharing your coverage of the show with us! Thank you so much for all the wonderful videos you shared with us while at Creativation. I can’t wait to get my hands on the new Vicki Boutin collection, Kaleidoscopic! I am looking forward to getting the glitz paste by GinaK and the foil pen by WeRMemory Keepers. Too many products to choose favourites!! However the new foil pen for diecut machines from WRMK looks very interesting. And I’m looking forward to lots of new stamps and dies to use my new copic markers on! Thanks for all the updates and sneak peeks!!!! Would love to win a surprise!!! I just want to see it all! Can’t wait! I’m a paper junkie, so I am excited to see the new paper collections for any and all companies! Cannot wait to get my hands on the new Jillibean Soup lines. Thanks for the great show coverage. It must have been a blast to be there. So hard to choose just one candy from this beautiful candy store 😉 all of them look so “yummy” Doodlebug Design is always a treat, and Paige Evans design papers….wow! Hero Arts stamps! All the companies have done a wonderful job, all the products are so nicely done and make our hobby so enjoyable. Thank You for sharing the videos. I love anything and everything from Doodlebug and Lawn Fawn. Can’t wait for their new products to become available. My favorite is Doodlebug Washi Tape! Such great sneak peeks all week! Looking forward to Simple Stories farmhouse collection! I really am excited about so many of the products coming up with Gina K, Lawn Fawn, and doodlebug! Thanks for all the videos! Looking forward to Die Cuts with a View graduation line that has some color in it other than black. I broke the bank on the pre-order for Lawn Fawn’s spring release, so that’s obviously what’s got me excited. I’m sure all the products are great but my favourite is Simple Stories. Can’t wait to see what they have coming out. I can’t wait for the new Pebbles, Doodlebug and Simple Stories. What a great business to be in with the chance to see and test drive all of the new crafting products for us. Looking forward to seeing all of the goodies from American Crafts and Doodlebug Designs. See you in less than a month at C&C Toronto. Thanks for the chance to win. Wow! Truly exciting. 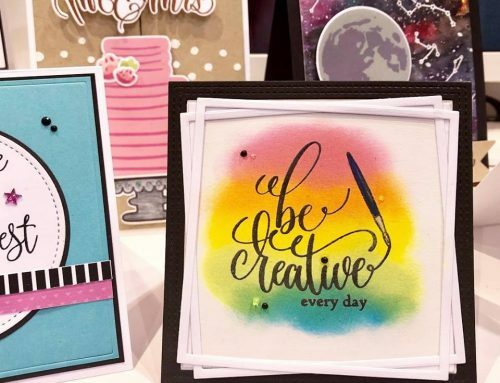 Loved watching all the new things coming from Creativation 2019! Thank you for giving us the opportunity to win some awesome prizes. I really have to tell you that the top thing on my bucket list is not an exotic place in the Philippines or Hawaii. It is to go to an event like Creativation! I love everything about it. It is eye candy!!!! It is my Utopia!! The videos , blogs, IG were so well done and got my in the mood for Toronto Crop and Create. I can’t wait! I think the most I am looking forward is to Vickis new line, and I was so inspired by your Hero Arts Interview I can’t wait to get my hands on that stamp set! Way to go Scrapbook and Cards Today! So many fun new products but I really must have the Foil Quill from WeRMemory Keepers. And several collections from PhotoPlay Paper and Color Kaleidoscope collection from Vicki Boutin. I can’t wait to see all of these new products! I always love Paige Evans Pink Paisley products. So excited for her new one! Wow would it ever be fun to attend this show! I I think I would be totally overwhelmed. I’d have to say Tim Holtz products would be what I gravitate towards. I think that crafty collection by Echo Park looks irresistible! Thank you so much for the company videos of new products. Loved them all but especially Gina K, doodlebug, Alte New, , Concord @9th and Vicki Boutin. So many lovely new products. please dont be disappointed if I did not mention your favourites , they are all my favourites but I only have so much room here to drool. Fun pictures! It looks like you all had a wonderful time! So many I am looking forward to…. new Lawn Fawn, Tim Holtz, Hero Arts and Vicki Boutin’s line! Totally looking forward to the Foil Pen, all things Altenew, G45, Hero Arts and tons of American Crafts goodies! If only my pocketbook was as full as my wishlist! I have done some cleaning out in my craft room to make room for the latest and greatest products! TFS! So many good things I can’t wait for. Lawn Fawn nailed it again. I love Tim Holtz and can not wait for ALL his goodies. The alcohol ink pearls look awesome and I love so many of his stamps, dies, ideology goodies and shifters. Gina K came out with so many items I want as did Altenew. I could go on and on. Too much stuff not enough time to play with it all but hey there are far worse problems to have, lol. I loved watching the movies. I can’t wait to see the new products. Maybe some of them might make their way into the Monthly Sampler packages of excitement. I am anxiously waiting for the Foil Quill from WE R Memory Keepers that I just pre-ordered. Also liked the stay-tion. Oh how could anyone pick just one!!! All of Vicki Boutin’s stuff looked awesome…and the art station looked cool…not to mention all the different stamps and dies. It was great to see the videos so I know what to watch for! I think I watched every one of your videos last weekend. I didn’t get much else done around the house or in the craft room, but I enjoyed every minute of watching. It is so much fun to see all the new things that will be available this winter and spring. I like having those fun new things to look forward to. Thanks for sharing with all of us who must stay home. I can’t wait for the new Lawn Fawn line! Thanks for the chance to win this amazing giveaway! Hands down I can hardly wait to own the Foil Quill by We R Memory Keepers! All the other products are great too. I’m so jealous that you all got to see all the new products in person. Love it all ! Especially all the new things for the Cricut, mostly the foil pen! Thank you for the summary and sharing your experiences. I look forward to Bella Blvd. and doodlebug papers. The altanew stamps and masks. Thanks for the opportunity to win. I am looking forward to the new Lawn Fawn products the most!!! Congratulations. Thank you so much. Looking forward to all the new paper lines coming out. Lawn Fawn’s magic picture changer will be a hit this coming season. Congrats on reaching 30K followers on Instagram and thank you for sharing all the product showcases during Creativation. Creativation seems like so much fun! I’m looking forward to Paige Evans’ new line the most! My favorite thing to use when crafting is patterned paper! There are so many wonderful new products, I really want the We R Memory Keepers Foil Quill, looks so cool! I am loving the Lawn Fawn products and the W R memory keepers Foil Quill! I am excited about Ranger Alcohol Pearls. The foil quill was so impressive! I think that is my #1. Oh, and congrats on hitting 30K on Instagram!! Following along with everyone at Creativation makes us want everything coming out this season! Oh one day I will attend Creativation – bucket list. My most anticipated product? How many characters fit in this comment box? 🙂 If I had to narrow it down to one thing I would have to one thing hmm I would say Vicki Boutin’s new collection Kaleidoscope! Wowza! I’ve been really loving watching all the great videos.. really looking forward to getting my hands on most of these new products…. especially the foil quill … game changer!!!! Wow that looked exciting I love seeing all the new. I love the new kaleidoscope line from Vicki Boutin! So colorful, it will be perfect for tons of projects! So many new things to love. But my fave is probably Paige Evans’ new paper line, Horizon. I’ve done some traveling recently and this line would be perfect for my pics. Thank you for the chance to win. I can’t wait for the stencil staytion to become available in my area! Thanks for the great coverage of the show. Congrats on your milestone – we followers love to see all your posts! Thanks for all the videos too. 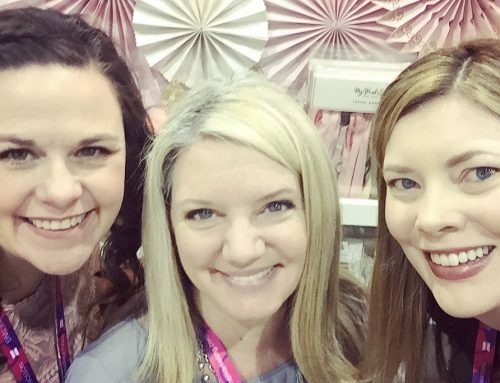 Not only did you have a great time, but you gave us all good looks at some great new products! Off the top of my head, I’d say I’m most interested in Lawn Fawn’s new release and Simple Stories upcoming collections. (Paper is always my first crafting love!) Thanks for all the updates, SCT! I’m excited about the foil machine that Gemini has put out. It looks like fun! I am excited about the flocking from Thermo-Web, archival distressed inks from Ranger, the cutting tool from My Sweet Petunia, and oh my geez…. Stamps! Such a great show Creativation! Thank you for sharing. I can’t wait for Gina K Designs Stamp and Stencil products. OMGoodness where do I start. Thanks for posting those videos. It was so exciting to see all the new products coming out. I loved it all. But I must say I was pretty impressed by the WRMK’s new pen. And it’s going to fit in my Cricut and other machines. I love that they made it so it works in several different machines. I so enjoyed seeing all those companies, the people running the companies, what they had to say and best of all the products. You could tell just watching the videos that the whole place was charged with excitement. Lots of fun things to play with, but for me it is always about beautiful paper! Looks like a great time! My daughter lives in Phoenix so will have to try those places to eat. I can’t wait to see the foil pen up close. I’m looking forward to more C&9 Turnabout Kits & the new LF papers. Thanks for a chance at the giveaway! Wow!!! Thanks for sharing!!! I can’t wait for the new Lawn Fawn, Simple Stories and Doodlebug’s releases! And many others too!!! Thanks for the chance to win this awesome prize!!! Fingers crossed!!! And also, congrats on your 30K followers on Instagram! So much to choose! Vicki Boutin, Gina K and anything from Tim Holtz are my favoritecs! But the paper lines from carta Bella are also super cool. I’m looking forward to the new paper lines…especially Simple Stories, Echo Park, and Bella Blvd, Thanks for the giveaway! thanks for all the videos…so nice for all of us who couldn’t be there. Looking forward to tim Holtz robot diecut. A lot amazing new products that I want them all. Gina K., Doddlebug, Nuvo, and Tim Holtz arr some of my favorite. I love Lawn Fawn and how they create add-ons. And how can I forget about Altnew. Their 3D dies are calling my name. I saw a video of Simply Story new products and I plan to purchase their products for the first time. Once I get a Circuit Maker and plan to get the We R Memory keepers Foil Quill. Scrapbook and Cards thanks for providing footage from Creativation. I’m very excited by Doodlebug’s new papers! I’m in awe of Shimelle’s new line!! Catherine,do you think you could talk her into coming to Cornwall???? Looks like you had a great time! I cannot wait for the Wendy Vecchi “Stay-tion”. Game changer!!!! Mouth watering products make it really hard to not get excited about each and every brand. As a tool junkie, I’m always curious to see what amazing new tool that We r Memories comes up with! 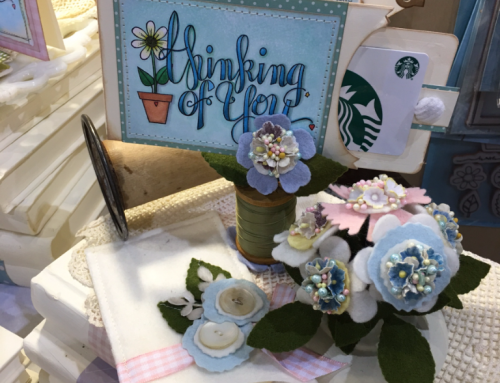 Lawn Fawn is incredible…but in the end anything new is exciting so hats off to all the Creativation vendors. To pick one isn’t possible – so many new & beautiful things to choose from! Thank you for sharing your time there. It is greatly appreciated. Scrapbook.com is my favorite candy store. I just love everything they have to offer—I love the variety, all the difft brands to choose from and the weekly specials they offer. Looking forward to all the new products from your partners for your company! Thank you for the chance to win! Excited! Just to see what the designers have come up with!.Love to see it,can’t wait for it to start showing up in stores.Thank you SCT!. Can’t wait for doodlebug and Paige Evans lines. I’ve already preordered the Vicki Boutin new collection! I really love Shimelle’s new line. …plus, I want to check out some more videos about the show– it looks like it was an amazing time! Thanks so much for sharing about it! I am looking forward to the new Fawn Lawn products. Thanks for the chance to win! I love the new Lawn Fawn products! Thanks for the chance to win! Wow, that sounds like a lot of fun but exhausting lol. I’m really looking forward to the Tim Holtz oxide sprays. It’s soooooo hard to pick one.. but I really love everything DOODLEBUG does! There has never been a new release that hasn’t stolen my heart! Looks like you all had a BLAST! I’m saving up to go next year! Thanks for the chance! Thanks for making all the show videos for those of us that are unable to be there in person. The Foil Quill is at the top of my list, as well as the Ranger Alcohol Pearls ink. I’m so excited for Vicki Boutin’s new collection Kaleidoscope!! It’s so gorgeous! I am excited for the quill, the new Shimelle, and Heidi’s Wolf Pack! And echo park Neverland! I love the We R Memory Keepers new top for foiling with electronic die cutters. Having a brain cramp can’t remember the exact name. Cant wait to see how all this translates into crafting inspiration in the magazine!! The foil pen for the electronic machines by We R Memory Keepers was my favourite. There was a lot of other new and exciting products to try as well. Can’t wait to buy them! Would love to win the surprise package! The Foil Quill by We R Memory Keepers has my heart all a flutter! I can not wait to see all the new papers that are coming out. New stamps are on my list, but DoodleBug, My Mind’s Eye and Photo Play I have my eyes on!! So many fun new things that are making me wish I could add more hours to my day to craft! I’m really liking Gina K’s sneak peeks! Doodlebug is always at the rope of my list, especially now that they are team players with Bella!! Great women making great products! Following the insta-stories about Creativation made me feel very much part of the fun that you had. The highlights and sneak peeks had me on the edge of my toes! I am looking forward to playing with some new products. Loved all the previews from the show – so exciting to see all the new stuff . Especially looking forward to Vicki’new release and the Tim Holtz new lines ! Lots of great stuff from American Crafts and Heidi Swapp too ! Intrigued by Wendy Vecchis Mat Board! I so enjoyed reading your recap and seeing all your InstaStories last week. Congrats on 30K! Thanks for the chance to win! I can’t wait to get my hands on Maggie Holmes’ Sunny Days and Vicki Boutin’s Kaleidoscope! Hi!! There are two things at the top of my shopping list from Creativation. 1. The Foil Quill – I love my Cricut and I love foiling. Combining the two sounds like so much fun!! 2. Tim Holtz Pearl Oxide Inks – TH inks are amazing. Adding the pearl element just makes for amazing coloring. These are just a few of so many amazing things showcased. I can’t wait to see the new products. Doodlebug and Photoplay would be the first two in a very long list of company’s new releases that I would love to have. Gosh, I’m new here and I had a lot of reading and catching up to do. Seems like this year the products are more versatile and hopefully easier to use. Of course I always look forward to what Tim Holtz is doing and anything with paper….love the paper! Thank for the change to be part of the giveaway. That is the cutest little dance. A big thank you for keeping us in the loop on all the new goodies, you guys did a great “not” job… lol… get it? I honestly cannot choose between all these great new goodies, they are all awesome and I want so many of these. All I can say is a big thank you for all that you do. I’m so into doodlebug right now! I love their value kits..you just need one of those puppies in your bag and you are set for a crop! Everything you need in one spot! The Spring and Easter lines are mix and match so that is going to be a lot of fun to play with as well! Thanks for the chance to win! I am looking forward to WeR Memory Keeper’s new hot Foil Quill. I am excited to see all the new Echo Park collections, especially the travel collection. Thanks for the chance to win. I am excited by the glimpse I got of Heidi Swapp’s Wolf Pack collection. I’ve already mentioned it to my local scrapbook store, Scrapbookers Anonymous! Thanks for the chance to win. So much to look forward to, so hard to choose!! Can hardly wait to see all new things for foiling!! Being able to do more with the gorgeous foils is exciting! Especially the Foil Quill!!! Thanks for the chance to win!! I am super excited about the Altenew release. Not only did I discover this company because of the Facebook live you did with them during Creativation, but I totally fell in love with their vision! Thank you SO much for sharing your world with the world! Oh my gosh! Where to begin!! I was always fascinated about STAMPING and SCRAPBOOKING so I usually go and research great websites and yours is absolutely amazing! I really interested to also see new products from Doodlebugs! Love your energy and passion ! My two favorite designers are Vicki Boutin and Shimelle; I see they both are bringing the colour, bringing the glitter, and bringing the shine! I can’t wait to try some of their new products. All the new products look so great but I’m especially looking forward to the Doodlebug stamps and dies! I’ve been a scrapbooking addict for almost two decades so new paper lines are always a must. But two years ago I started dabbling in card making. This past year it’s become an addiction. Love seeing new dies but this year I want to branch out into layering floral stamps. Loads of fun being had there I see. Wish I had been there!! So many awesome new products coming our way. Looking forward to all of Tim’s new stuff and a foil pen?! Yes, please!! Impossible to pick one product. There are so many new paper collections that I like! I can’t wait to play with the alcohol ink pearls!!! I loved watching all the Creativation coverage with you guys. A candy store indeed! In terms of new releases, I’m most looking forward to some of the SS and EP collections. As well as VB Kaleidoscope and Lawn Fawn! Can’t wait! So impossible to pick a favorite! Love the Simple Stories new collections! Oooh it would be a dream to go! It looks like soo much fun! I think im most excited for the wrmk foil quill. #gamechanger!! Oh boy! There is sooo much out there. Every year I am thinking – how can they top it? This year, I am really excited about the non-drip hot glue gun. Is that even possible? If yes, I am the first one to sign up. Thanks for the videos on YouTube. I love watching them. loved watching all the updates, loved all the new products. I am a sucker for all things crafting this time of year….I really can’t pick just one. I am very excited for the VB new line, and always drool over WRMK tools….the new foil pen is very intriguing… the list goes on! Thanks for the chance to win! I can’t wait to start playing with Paige Evans’ new collection Horizon. It is so colorful and beautiful, and scrapbooking with collections like that make me so happy! Sounds like a great time. I’ve recently retired due to health issues and some new supplies would help me fill the hours. Thanks for the opportunity to win. That foil pen thingabob for my cutting machine!!! Sounds like a good time was had by all. There are so many great new products coming out it would be impossible to just name one favorite.!! Thanks for sharing your experience at Creativation. It was great seeing the videos and photos. I think my favorite new product that I can’t wait to buy is the Ranger Make Art Stay-tion by Wendy V (I think). That looked like it could make crafting so much easier in so many ways! I wish I could’ve gone with y’all…what fun! I’m intrigued by the WRMK Foil Quill tool that can be used in electronic cutting machines. Looks amazing!!! I am having a really hard time picking one of the many awesome products that were shown at the show. I must say I am especially excited about WeR Memory Keeper’s new hot Foil Quill. It is hard pick just one of the many awesome products that were shown at the show. I must say I am especially excited about WeR Memory Keeper’s new hot Foil Quill. Thanks for the great coverage of Creativation 2019. I got a Sizzix Big Shot for Christmas and am looking forward to using it with some new dies. I want most of the Simple Stories and Shimelle lines! Ok, one of everything! There are so many great new products. I want the Simple Stories lines. Loved your Facebook lives from Creativation! Meghann is a real pro behind the ‘camera ‘. There was just so much to love from all the companies but my top two would be Heidi Swapp’s Wolf pack collection and Simple Stories new budget planner, which I’m going to buy for our friends daughter who is graduating from high school this year. Thanks for the chance to win! Love the new Vicki boutin line. Looks like you all had fun! So many wonderful products coming our way makes it very hard to pick a favourite but I would have to say Vicki’s new collection and Simple Stories new lines. Thanks for the chance to win!! Everything looks fantastic, but can’t wait for the new Vicki Boutin Kaleidoscope line to hit the market! I love Vicki’s products! looking forward to the new paper collections and stamp companies coming out. Thanks for the video. I’d have to say the new Seth Apter powders from Emerald Creek have captured my imagination! And, of course, that’s along with everything else… Thanks for the chance to win. I’d love to be able to squish myself into your suitcase, Catherine! There were so many great things this year but I’m really looking forward to the Pinkfresh Studio goodies. I’m looking forward to the new stamps and dies from Doodlebug. They’re so cute! What a WONDERFUL time you all had and so many new product. But I have to say, I’m most looking forward to Vicki Boutin’s Color Kaleidoscope collection. It’s on my MUST have list to start the year, now that I’m starting to scrap again. I am somewhat obsessed by Graphic 45’s Love Notes collection. . .although there are so many other new products that I want to try, as well! So jealous – would be so much fun to be there! I can’t wait for the alcohol pearls! One favorite!?! 😅 I just can’t…Vicki’s new watercolour markers, Heidi Swapp’s Wolf Pack line, Simple Stories Say Cheese 4 – stamps, dies AND stencils!!! I buy enough just from peeks, can’t imagine getting to be there. I’m so happy you have such a joy filled job helping us drool 😀 friend! I love everything coming out. My favourites would be Pink Fresh, Carta Bella and Simple Stories. Thank you for sharing a peak at the new lines. So exciting. Thank you for the opportunity to win an amazing prize. I can’t wait to see new paper from Simple Stories and Crate Paper. They always inspire me. It has been so much fun living vicariously through Catherine and the SCT team about all the fun at Creativation! There is so much to be excited about, but the product that has my heart going pitter patter is the Foil Quill by WRMK!!! I’m looking forward to getting my hands on many of the new Echo Park collections. You did a great job on the video of them! Thanks! Amazing that you are still walking and talking – such a exhausting time but looks like so much fun. Doodlebug pin – if I win is going to my friend who collects them. I am really looking forward to Photoplay’s Snuggle Up Baby Boy and Echo Park’s Hello Baby Boy. Thank you for all the videos, it made me feel like I was there with you all! I have made a long list of collections and product that I would like, but the one thing that really stood out was the We R Memory Foil Quill. I can definitely see why they won the award for most innovative. I am excited to see the Foil Quill too…if it isn’t too fussy to get it to work, I think the results are gorgeous! I am soooo excited about several new lines however from Simple Stories, Vicky Boutin and the distress sprays! It looks like you guys had an amazing time at the show!! Thanks for all the wonderful videos! I’m really looking forward to the new Pinkfresh goodies coming out! Especially the travel line! It’s hard to choose, I like them all! Can’t wait until the new collections come out. That’s for the chance to win. Congratulations on reaching 30k followers! Thank you for sharing all the videos. It was like we were with you. It was amazing! I wait in anticipation for the NEW foil quill pen. It looks amazing and works with the machines I already own. Thank you for your continued inspiration! So excited for you guys and loved the updates. I don’t have a specific product or product line, I love all things new. Anything with Color of course makes me happy and all the innovation every year makes me giddy and ready to try something new! I can’t wait for the new Foil Quill by We R Memory Keepers, looks so cool! I can’t wait to see the WRMK foil quill in action, and to get my hands on Vicki Boutin’s new collection!! Thanks for the fun sneak video! There is so much to be excited about. I don’t think I could choose any one thing! I am looking forward to the ARCHIVAL distress inks! I am very much looking forward to the Quill foiling tools! I want the travelers paint set that Amy Tan was using when Vicki B did a Facebook live!!! I’m drooling over that Foil Quill! I’m excited for everything! But especially new Vicki Boutin! I’m looking forward to the Distress Oxide Sprays & Wendy Vecchi’s STAY-tion. Congrats on the 30k followers, I just started following, too. How amazing it must be to go to creativation and get to meet all the designers and play with the new stuff! I’m a huge American Craft fan. I’ll be excited to see all their new lines. They always have such great embellishments. Congrats on 30K followers. that’s amazing. I wish I could have attended the show. I am loving the mixed media trend and am looking forward to all the new products and supplies. I love all the inks and media that are coming our way this year. I am really excited about the ranger new releases. Wow! SCT, you are so generous to us! How could I possibly choose? If I have to, it would be WRMK…because I just love new tools! Wow… one day I hope to see it all in person! Great to live vicariously through you all, though! Looking so forward to seeing Photo Play Paper… love their stuff! There are so many wonderful products to choose from, but the Foil Quill has my attention! I have enjoyed all of the updates and peeks. Into everything that’s coming our way. Thank you all for including all of us on your journey. I love anything Heidi Swap and Tim Holtz/Ranger products! But all of the new lines from all of the designers are spectacular! Looking forward to Photoplay and Simple Stories collections, which will inspire and motivate me to finish some old layouts! oh , and new Tim Holtz products are always a fave! I am most excited for Shimelle and Paige Evans collections. They are perfection for my travel photos. Oh my gosh, where do I start? LOL! There’s so many wonderful new products coming soon and I can’t wait for them all! Of course I’ll have to get just a couple at a time but I hope to have them all by the end of the year! I’m loving the new foil items from Gina K, and all the wonderful turn abouts from Concord & 9th, and the gorgeous new collections from Graphic 45, and the fabulous new floral stamps from Altenew, and of course everything from Tim Holtz, especially his new Pearl alcohol inks! Thanks for the giveaway opportunity and all your fantastic videos from the show! Wishing I could have been one of you. I am most excited to see the NEW Carta Bella lines- Baseball and Flower Market. Have a slight obsession with Carta Bella…lol. Thanks for a great view into Creativation! And thanks for a great Giveaway!!! I always get excited (and a little nervous–for my budget! ack. lol) about these shows. One of my bucket list items is to attend one of those shows and to get all kinds of products. swoon!! Love all the new products that come out this time around. Seriously, who wouldn’t??. 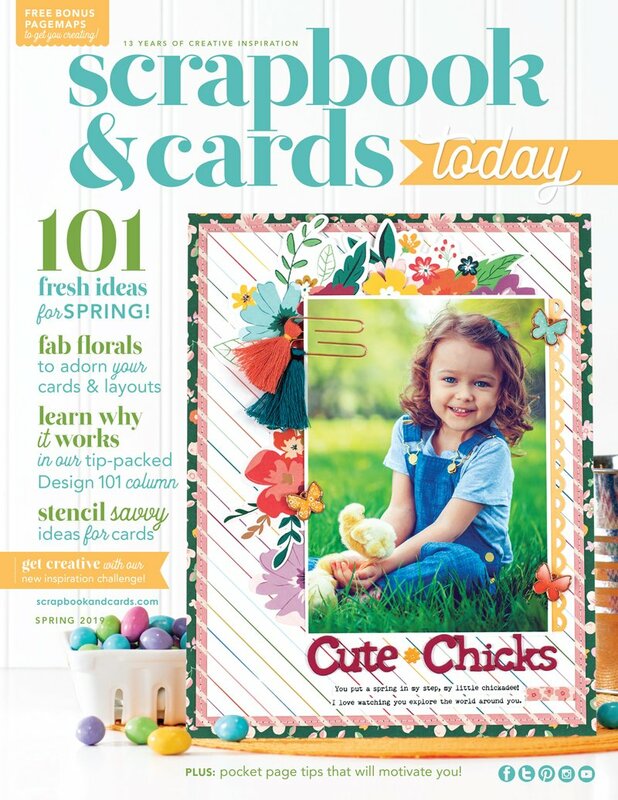 I am especially excited about the new Doodlebug and Photoplay products. Thank you for the wonderful opportunity! It’s official, I’m changing my name! 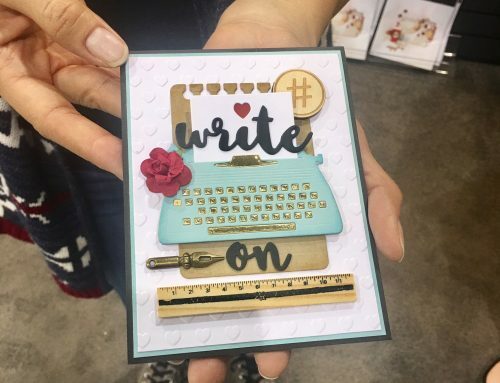 You can call me Veruca Salt (Willy Wonka & the Chocolate Factory), because “I Want it Now!” Paper, tools, embellishments, dies, ink, a day with Scrapbook and Cards, and to hang out at Creativation 2020!! What an exciting scrapbooking year I’m going to have!! Thx for the eye candy!! Holtz & Doodlebug & Gina K Oh my!! These are a few of my favourite things! Can’t wait! I love the Hero Arts layered iris stamp set.Wow it is hard to pick just one favorite! Hard to choose a favorite-so many wonderful items. I would like the foil pen. Love so many things. Love the new goodies from Altenew, the new glitter paste by Gina k. And I of course love crafters companion and their foiling machine! I love everything, it would be hard to pick just one ! Wow so many great new products. Good to have new products to get you going again. Love it all so hard to choose. Thanks for all of the great ideals and motivation. I really want to thank the whole SCT team for going above and beyond to keep us eager scrappers in the loop about all the new products coming soon!!! I drank lot of coffee watching all the videos and yelling out Oh wow, look at that! I love so many of the new products but if I were to go out and buy something right now I would look for Photoplay Free Birdie collection, Shimelle’s new collection and the Foil Quiller. I am soo looking forwnard to the foil quill package, AND, the magnetic board .. will be watching for both!! Thanks for the good coverage of the show. I really appreciated it. Better viewing than Netflix! I am excited to get Shimelle’s new collection; a couple of Jen Hadfield’s collections; Doodlebug (so hard to choose amongst all that cuteness but the stamp and die sets are a great addition to their product lines); Simple Stories little kids ephemera packs; Pimk Fresh collections; Carta Bella florals; and My Mind’s Eye 2 fun happy collections. These are just a few of my favorite things but I am going to have to look at my budget and see what is possible! I just love the crafting community!!! I really am looking forward to seeing new Pinkfresh Studio and Crate Paper! I am so excited to see Simple Stories, Shimelle and Vicki Boutin’s new products! Amazing!! Cannot wait to see all of you lovely ladies in Moncton very soon!! Really hard to pick, but I keep thinking of the new Maggie Holmes line Sunny Days and Shimelle’s sparkle City, so I will go with that. These will be so fun to mix with existing collections as well as to go in a new direction! Looks like so much fun! I’ve loved all the perks at new products and fun photos- my wish list is pretty long, but Distress Oxide sprays are pretty high up there, along with Dina Wakley’s new paints… thanks for a chance to win some surprises! If I had to pick one thing, it would be the new Gina K product. So many new things for the coming year – can’t wait ! The Foil Quill tips look amazing. I love new ways to use my Cricut. My favorite is Carta Bella! I enjoy your pictures from the event. Truthfully I am always excited for anything by Dyan Reaveley. I just love her snark and designs. Thanks for sharing everything along the way. I loved your updates and videos at the show. Everone looks like they are having so much fun. I am a big fan of Simple Stories and can’t wait to have some of their new products in my craft room. I can’t thank you enough for your comprehensive videos of the show and all the new products! And for this generous Giveaway! All the new products are amazing. Vicki Boutin was extremely interesting. And I loved Doodlebug’s paper collection. I am looking forward to Echo Park, Jilibean and Bella Blvd new products! So many fun new goodies on the way! Looking forward to Lawn Fawn, Gina K., and Tim Holtz goodies for sure! 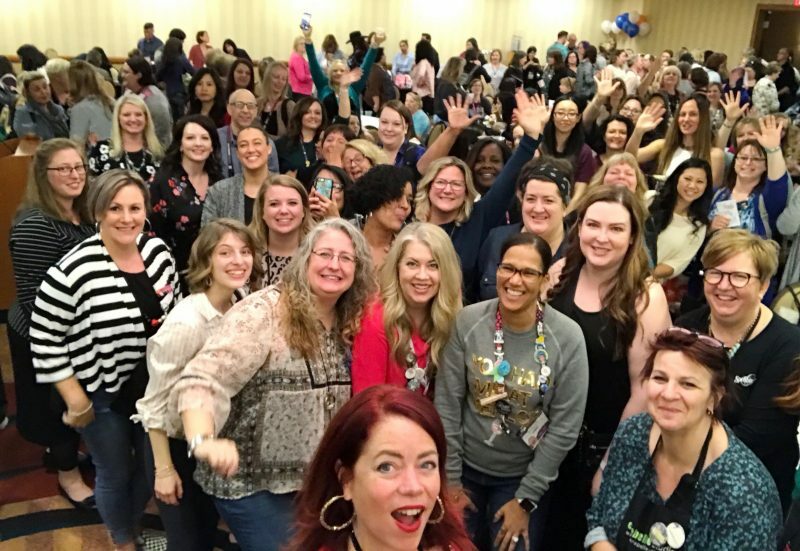 You started my 8 degree snow day off with a huge SMILE, reading about the fun you all had at Creativation. What an amazing experience that must have been. To see so many people together totally enjoying seeing new products and ideas, meeting each other…we all need that in our lives! There are so many wonderful things coming, but the two things I most anticipate are Tim’s distress oxide sprays (already ordered! ), and anything Altenew brings out! Thanks for all the goodness SCT shares with us! There we many amazing products shown at Creativation! Hard to pick just one! Loved Shimelle’s new line as well as the foil quil from we r memory keepers! Loved lawn fawns new release as well! Thanks for the chance to win! So many amazing products coming out. I am looking forward to Ken Oliver color sets, TCW stencils & Gina K Glitz Glitter Gel. Thank you for sharing with us a glimpse of what Creativation has to offer. The new products and releases are all very nice. As I am trying to get a better handle on organization this year, my favorite new product from the show is from We are Memory Keepers A la Cart and accessories. Can’t wait for the new foil pen that will work with my machine! Love all the new stuff. Keep up the good work. We R Memory Keepers keep coming up with afforable innovative tools for us. Can’t wait to get the Foil Tips! We R Memory Keepers keep coming up with afforable innovative tools for us. Can’t wait to get the Foil Tips! Amazing! Great videos! I am excited about Lawn Fawn’s new interactive die. I wish I could go to Creativation! Great videos! I am excited about Lawn Fawn’s new interactive die. I am a design nut so it’s so hard to pick one…love Doodlebug & Echo Park. Would be so much FUN to go to one of these events…like a kid in a candy store! Picket Fence Life Changing Blending brushes!!! They are soooo cool. After seeing all that was presented at the convention, my list is dragging on the floor. I’m not picky so anything I could fit into my budget is okay with me. Thanks for supplying information to those of us who couldn’t go. My fingers are crossed as well as my eyes, toes and anything else I can cross. Even if I don’t have yet a electronic cutter, like a silhouette or a scan an cut, I think the best new product that I saw was the foil quill. It might be the product to make me really want to get a scan and cut… I can’t wait to see what the crafting community will do with this new product,!! I am still going viewing all the new goodies so I don’t have a favorite. Congrats on hitting 30K! I know the best new product I saw was the Foil Quill by We R Memory Keepers. It looks truly amazing and could easily transform my creative process. The ability to present images in a foil format is simply amazing. I am just beginning in my addiction to all things card making, or anything else done with paper and all the goodies that go with it. I must say I really like Shimelle’s products and Tim Holtz’s goodies as well. And the thought of the foil pen (Was it Memory Keepers?) simply thrills me! Thank you for sharing all of these amazing new products!! Prima and Doodlebug for sure! I’m excited about so many things. I especially can’t wait for the new Simple Stories lines. WOW!!! 🙂 The new Foil Quill looks amazing!! I look forward to that and new lines from Simple Stories, Doodlebug and many more companies!!! Looks like lots of great new and exciting products are coming but my favorite and can’t wait for one is the foil quill. I can’t decide! I want one of EVERYTHING! I especially want to try the new slider dies from Lawn Fawn and I love anything Kindred Stamps! So many nice new products! I love to follow all the fun projects from companies in the crafting industry. Giveaways make it extra special. Thanks! Looks like so much fun! Can’t wait for all the new products especially Gina K Designs and Lawn Fawn! Can pick just one, all new product is so fun!! Thanks for sharing!! I love everything, but I can’t wait to see what Tim Holtz comes up with especially any new and pretty colors for inks. I’m really looking forward to seeing more about this Foil Quill from We Are Memory Keepers. It looks amazing! All of Vicki Boutin’s new line…the colors and oh the possibilities….also the we are memory keepers quit pen tool thingy (yes that’s a technical term) I am so intrigued! Man who am I kidding all new things are exciting and great!! Thanks for all the great videos while you were at the show. It’s so much fun to see the new products (almost) first hand 😀. Looking forward most of all to getting Shimelle’s Sparkle City and Paige Evans’ Horizon into my craft room!! Simple stories always has great collections-I love what Doodlebug’s design team members create with their collections. Sorry I couldn’t pick one. I love seeing new products. I can’t wait for all the new toys to arrive at the stores. And I’m a big My Minds Eye fan. Eeek, how exciting. You all have my dream job. Can’t wait for Echo Park and PhotoPlay new collections. Thank you for the opportunity! All the products are so amazing. I loved watching the youtube videos from Creativation and seeing the exciting booths. Thank you for sharing the event with us all. Right now, Lawn Fawn is my favorite….until I watch the next video!! It is impossible to pick one. Thanks for sharing. Love all the new paper collections. Echo Park, Photoplay, Bella Blvd. Altanew stamps. I watched all the live feeds and videos and I am so excited for it all, but if I have to pick just one I would say lawn fawn. Thank you for the chance to win and thanks for taking us with you at creativation. 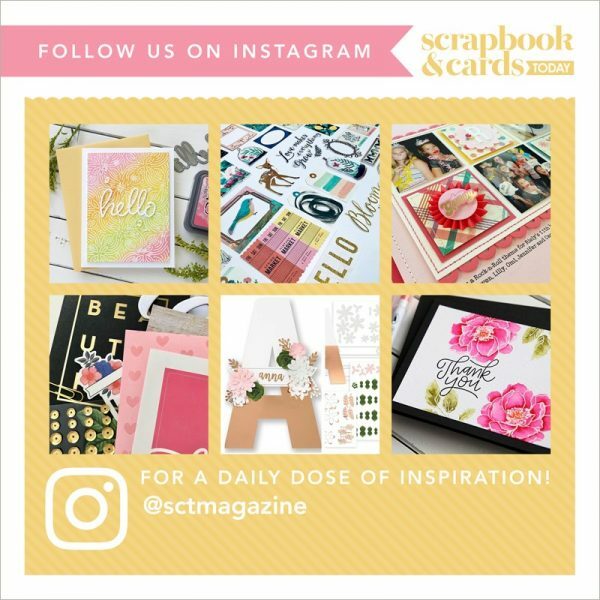 Scrapbook and Cards team is wonderful to show us all the newest and continue to inspire us with all the new Creativation goodies! Looks like a ton of fun!! My favorites are all the collections from Simple Stories like Say Cheese 4!!! I want to check out the Shimelles – they look so fantastic! Distress oxide sprays, heck yeah! I’m really excited about the new Lawn Fawn stamps and dies. I love the cute bunnies. by Aaron and how sincere and real he was about the entire stamping and crafting industry. so, so many beautiful collections however, if I had enough money, would probably order a wee bit of everything! Love all the new products from the Ranger Team! You all did a great job with covering the show and I can’t wait to play with some new stuff. Oh, that looks like so much fun! I used to go to trade shows for the fabric industry and it was the best part of my job! I am excited about a lot of new products, but I think the Distress Oxide sprays will be one of my first purchases. Thank you for the opportunity to win such a generous prize! I loved seeing your video from the We R Memory keepers booth the most with the Foil Quill. I can’t wait for it to come out. What an amazing new product. They deserve the award they received! I have a Brother Scan N Cut that I can’t wait to use it with. I think foil adds so much to cards…at least I think so. This will help me add foil to other items as well and I am just so excited about it! Thanks for putting out such an awesome magazine…and much more! You have the best job!!! I am always looking forward to Doodlebug and WRMK’s new products. Love all of your updates on new products. Can hardly wait to see them! Thank you for all of the great YouTube videos from Creativation. I love watching all of the new products. My favorite has to be Neverland from Echo Park. I can’t wait to get my hands on that entire collection. I always look forward to the new papers and embellishments but my favorites are the new tools from WR Memory that are so helpful. I think my favorites are always the new paper lines. But gosh, I just couldn’t pick one. I love them all! Going to CHA (which will always be CHA) is on my bucket list. If you need some extra hands next year, I’m your girl! And I’ll try not to fan girl to much with the SCT crew. But it will be near impossible! Love PTE’s new line and the WR foil pen! Wow! You all looked like you had so much fun, and were very busy with classes, meeting old and new friends! So happyyou all had a great time. And a new and wonderful office.